You are here: Home / Blog / Cancer / What is Squamous Cell Carcinoma? Skin Cancer 101: What is Squamous Cell Carcinoma? 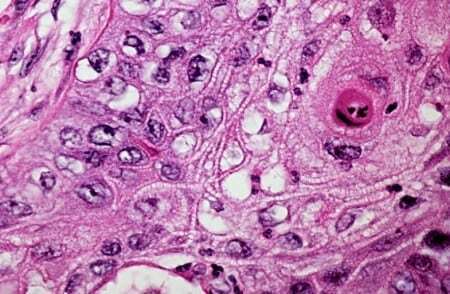 Squamous cell carcinoma under microscope. Like all forms of cancer, squamous cell carcinoma is the result of a mutation to the DNA of the cell that cause it reproduce rapidly and uncontrollably. If SCCs are left untreated for too long, they may become highly disfiguring, or even deadly. 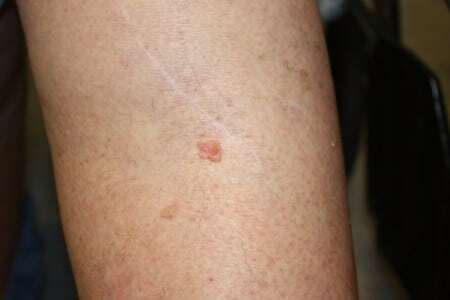 Skin that has been damaged by the sun may often be at risk of developing SCC. An minor, outpatient surgical procedure during which the patient is given general anesthesia and the affected area is cut away. Pronounced “moes,” this specialized surgery is used specifically for skin cancer. A dermatologist will cut affected skin away layer-by-layer, using a microscope to make sure all cancer cells have been removed on the bottom layer. Radiation oncologists, such as those at SERO, utilizing radiation therapy to completely eradicate the tumor over the course of several weeks of radiation treatments. Generally performed on smaller lesions where growth is scraped off with an instrument with a sharp, ring-shaped tip (a curette), and the tumor is burned. https://treatcancer.com/wp-content/uploads/2015/08/Well_differentiated_squamous_cell_carcinoma.jpg 512 785 Southeast Radiation Oncology Group, P.A. https://treatcancer.com/wp-content/uploads/2015/08/SERO-logo-PNG-450x174.png 2015-08-06 19:00:232018-10-11 18:17:53What is Squamous Cell Carcinoma? 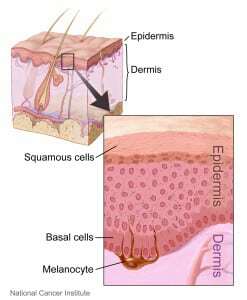 What is Basal Cell Carcinoma? What is Actinic Keratosis?